Will Wall Street Get a Santa Claus Rally This Year? Will Santa Claus Visit Wall Street This Year? Yes, it appears grown men and women like the notion that St. Nick showers them with gifts of stock market gains every December. I don’t know about you, but I have no plans to bet the farm on the market rising or falling over any particular 10-day stretch. Many variables can swing the market either way in any given year, and a Santa Claus rally is by no means a sure thing. Just two years ago, the 2015 holiday season happened to fall amid the market correction that saw the Standard & Poor’s 500-stock index drop more than 13% between its November highs and February lows. But, as the numbers show, the Christmas and New Year season usually is a good time to be invested. How will the holidays play out this year? Will Santa be generous, or leave us with hard lumps of coal? Let’s look at some of the factors that might swing the market either way. We all know valuation is meaningless over the short-term, even if it arguably is the single biggest factor driving returns over the long-term. To paraphrase value investing icon Benjamin Graham’s famous thought, the market is a voting machine in the short run, but a weighing machine in the long run. But in an expensive, bubbly market – particularly one that has been driven by central bank stimulus – there is greater risk that a minor and healthy correction snowballs into a real bear market. Is it an expensive market? Well, the S&P 500’s current price-to-earnings ratio of 24.8 far above the historical mean of 15.7, and index is trading at 2.2 times sales – its highest point in at least 15 years. Valuation might not be a screaming danger to a Santa Claus rally, then, but still consider it a check mark in the “bah humbug” column. You should take momentum much more seriously than valuation as a short-term indicator. And while November has started off slowly, most momentum indicators point to a generally healthy bull market. The “Trump Rally,” if you want to call it that, is very much alive and well. 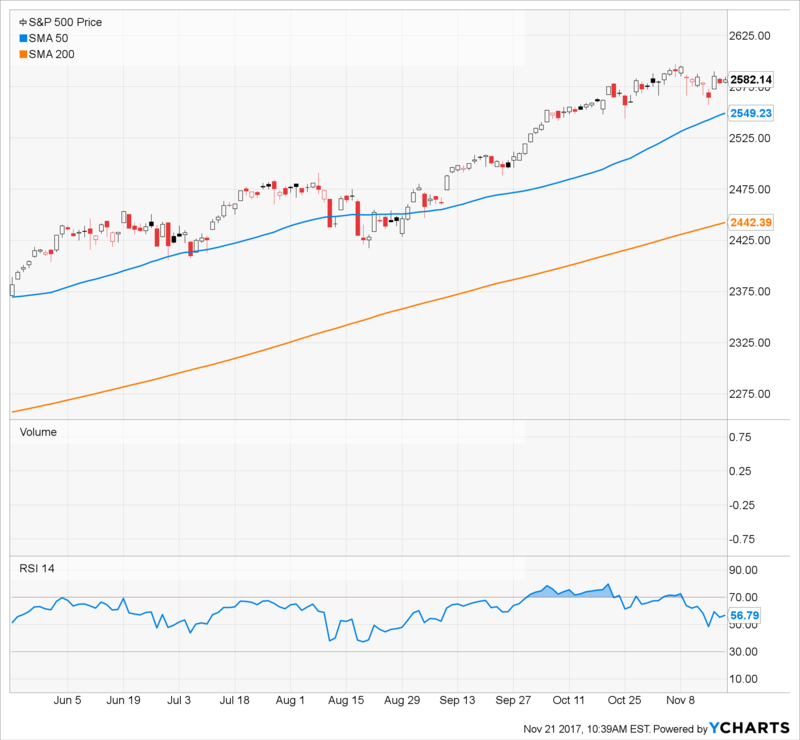 The S&P 500 is comfortably above its 50- and 200-day moving averages, which you expect to see in a healthy, rising market. Market breadth – the number of stocks rising vs. the number of stocks falling – has slipped a little of late but remains in a healthy range. Credit spreads have widened lately, and if that continues I might start to worry a little. When spreads are shrinking, investors are confident that the economy will stay healthy and are comfortable accepting lower rates – but rising spreads reflect lower investor confidence of repayment. For now, though, this market appears to be healthy, and the uptrend remains intact. This is the biggest wild card. Just the prospect of lower taxes and more relaxed regulation was enough to awaken the animal spirits for a full year. But at some point, our government must actually deliver those promised changes, which – to date – it has mostly failed to do. The Trump administration has been friendly to energy companies and pipeline operators, sure, and has been uncharacteristically restrained when it comes to implementing new regulations. In fact, for all intents and purposes, there really haven’t been any new regulations since Trump took office. But there also has been a total absence of large-scale reform. Healthcare legislation died an unceremonious death in the Senate, and as I write this, corporate tax cuts have yet to be passed completely. November’s market hemming and hawing has at least in part been attributed to fears that tax cuts will wither on the vine, just like health care reform. Yes, the House passed a sweeping bill, and the Senate Finance Committee approved its own plan, which will be considered by the full Senate after Thanksgiving. But as I write this, Sen. Ron Johnson, R-Wisconsin, has come out against the Senate’s tax plan, and several other members of the GOP aren’t yet considered locks to vote for the current iteration. Still, barring a complete collapse in Congress, don’t expect much else out of Washington to rock the boat. The transition to a new Federal Reserve chair is going smoothly, and tensions with North Korea seem to be slowly easing, too. Without anything obvious on the horizon, macro risks (or lack thereof) would seem to point to a Santa Claus rally. The market has a funny way of doing precisely the opposite of what you expect it to do. But it looks like we’re being set up to enjoy a decent rally this holiday season. So make the eggnog a little stronger this year, and enjoy it. We’ll deal with 2018 soon enough.